Mapbox Studio, is where you can create, modify and digitise your own vector and raster GIS data, and crucially store on their servers, and access through web services. It is possible to use Open Source tools like GeoServer to store as much data as you want for free, though this is harder to set up ‘from scratch’, and there is fairly generous amount of data storage available for free on Mapbox. You can begin by either importing, modifying or creating GIS within Mapbox Studio Datasets, this being “a dataset is an editable collection of GeoJSON features hosted in your Mapbox account”. This may (or may not) seem complicated, but the mapping environment is very intuitive, with OpenStreetMap data layers underlying and it is easy to add attributes to your data too. You can also ‘export’ this as a GeoJSON layer for other platforms. Once you are comfortable with your GIS data, you move to the next step can upload as a ’tileset’. Top Tip – You can go back and update/modify the dataset many times and once you hit the ‘Export’ button in Datasets, and it will update the data all the way up to ‘Styles’ and web map itself, with no need to re-upload. Tagging and knowing the scripting syntax is the key (as well as patience), but to begin with your web map should contain ideally a title as well as a reference to the script library you need to refer to. The below code snippet gives the basic set up and reference to Mapbox GL JS script as hosted by Mapbox. However, while this references things appropriately, it doesn’t even add a map to your document. There are two things required, first of all your unique Mapbox API token which authorises access, and then mapboxgl.map class which adds the ‘map’ object to your HTML document. Altering and adding in parameters means you can tailor this code and other pre-built functions to create a customisable map for your needs. Just building on tutorials on the Mapbox website and the JS API Reference documents meant I’ve been able to create web maps using Mapbox such as these – (Music Map and Football vs GDP Map). These tutorials (choropleth map and data driven circle styling) were particularly useful in getting started and building confidence with this, as too the links below and mentioned previously. 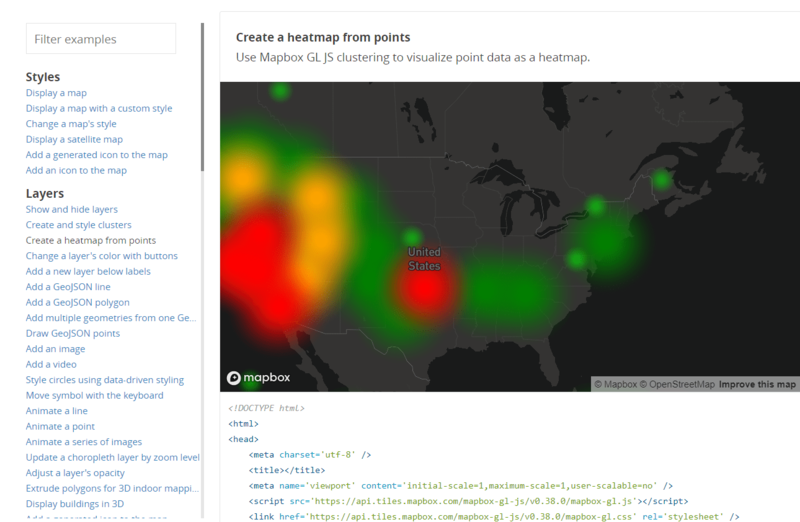 Soon you could be making interactive maps with Mapbox, such as this one below. I hope this series of posts have helped provide an entry to the world of web mapping and the options available to you, hopefully demystifying things a bit. It is an ongoing journey, I am still very much in the process of learning myself! This isn’t an exhaustive list of web mapping options but covers the main ones, and neither should you have to chose between them, all these options and others are reasonably easy to integrate within each other. For example, you may want to use a Mapbox Style map as your basemap for your CARTO infographic. There are many options and ways to get stuck in, and whether involved in mapping, GIS, web development or something completely different, geo-web development is becoming an increasing useful and relevant skills set to have. P.S: Apologies for the lateness of this final post – I’ve been ill recently with a brief spell in hospital, just before I was about to finish this series of posts, and have only just found time to finish this.